Do This In Memory Programme is the First Communion preparation programme being followed in our parish. This year (2019) The First Communion in our parish is on 18th May at 11.00am. Do This in Memory offers parents/guardians, children and the parish community the opportunity to prepare together for First Penance and First Communion. The programme is designed to take place within the context of the Sunday Parish celebration of the Eucharist. It is then continued in the home through the use of activities and resources for both parents/guardians and children. This highlights the importance of the Sunday Eucharist as a place where we gather, are nourished by the Word and the Bread of Life, and are sent forth to live the Gospel. It also acknowledges the home as the most important and significant place, where the faith of our children is nurtured, nourished and sustained. The programme begins with an Enrolment Sunday in late September or early October and then continues on one Sunday a month concluding on the feast of Corpus Christi. The Sundays on which the programme takes place have been specially chosen because of the Gospels accessibility to the children. The readings and Gospel taken from the Children’s Lectionary are included in the Manual. Suggestions for the Prayer of the Faithful and a Communion Reflection are also offered. The Coordinator’s Manual offers homily guidelines and suggestions for making the Sunday celebration, and indeed the church environment, a place where children feel welcome and have a sense of belonging. It is available from Veritas. 137 Cf. ⇒ 1 Cor 15:28. 1328 The inexhaustible richness of this sacrament is expressed in the different names we give it. Each name evokes certain aspects of it. It is called: Eucharist, because it is an action of thanksgiving to God. 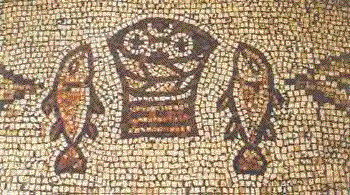 the Greek words eucharistein139 and eulogein140 recall the Jewish blessings that proclaim - especially during a meal - God's works: creation, redemption, and sanctification. The Holy Sacrifice, because it makes present the one sacrifice of Christ the Savior and includes the Church's offering. the terms holy sacrifice of the Mass, "sacrifice of praise," spiritual sacrifice, pure and holy sacrifice are also used,148 since it completes and surpasses all the sacrifices of the Old Covenant. 139 Cf. ⇒ Lk 22:19; ⇒ 1 Cor 11:24. 140 Cf. ⇒ Mt 26:26; ⇒ Mk 14:22. 141 Cf. ⇒ 1 Cor 11:20; ⇒ Rev 19:9. 142 Cf. ⇒ Mt 14:19; ⇒ 15:36; ⇒ Mk 8:6, ⇒ 19. 143 Cf. ⇒ Mt 26:26; ⇒ 1 Cor 11:24. 144 Cf. ⇒ Lk 24:13-35. 145 Cf. ⇒ Acts 2:42, ⇒ 46; ⇒ 20:7, ⇒ 11. 146 Cf. ⇒ 1 Cor 10:16-17. 147 Cf. ⇒ 1 Cor 11:17-34. 148 ⇒ Heb 13:15; cf. 1 Pet 25; ⇒ Ps 116:13, ⇒ 17; ⇒ Mal 1:11. 149 Cf. ⇒ 1 Cor 10: 16-17. 1334 In the Old Covenant bread and wine were offered in sacrifice among the first fruits of the earth as a sign of grateful acknowledgment to the Creator. But they also received a new significance in the context of the Exodus: the unleavened bread that Israel eats every year at Passover commemorates the haste of the departure that liberated them from Egypt; the remembrance of the manna in the desert will always recall to Israel that it lives by the bread of the Word of God;154 their daily bread is the fruit of the promised land, the pledge of God's faithfulness to his promises. The "cup of blessing"155 at the end of the Jewish Passover meal adds to the festive joy of wine an eschatological dimension: the messianic expectation of the rebuilding of Jerusalem. When Jesus instituted the Eucharist, he gave a new and definitive meaning to the blessing of the bread and the cup. 1336 The first announcement of the Eucharist divided the disciples, just as the announcement of the Passion scandalized them: "This is a hard saying; who can listen to it? "158 The Eucharist and the Cross are stumbling blocks. It is the same mystery and it never ceases to be an occasion of division. "Will you also go away? ":159 The Lord's question echoes through the ages, as a loving invitation to discover that only he has "the words of eternal life"160 and that to receive in faith the gift of his Eucharist is to receive the Lord himself. 1343 It was above all on "the first day of the week," Sunday, the day of Jesus' resurrection, that the Christians met "to break bread. "167 From that time on down to our own day the celebration of the Eucharist has been continued so that today we encounter it everywhere in the Church with the same fundamental structure. It remains the center of the Church's life. 1344 Thus from celebration to celebration, as they proclaim the Paschal mystery of Jesus "until he comes," the pilgrim People of God advances, "following the narrow way of the cross,"168 toward the heavenly banquet, when all the elect will be seated at the table of the kingdom. 152 Cf. ⇒ Ps 104:13-15. 153 ⇒ Gen 14:18; cf. Roman Missal, EP I (Roman Canon) 95. 154 Cf. ⇒ Deut 8:3. 155 ⇒ 1 Cor 10:16. 156 Cf. ⇒ Mt 14:13-21; ⇒ 15:32-39. 157 Cf. ⇒ Jn 2:11; ⇒ Mk 14:25. 161 Cf. ⇒ Jn 13:1-17; ⇒ 34-35. 163 Cf. ⇒ Jn 6. 164 ⇒ Lk 22:7-20; Cf. ⇒ Mt 26:17-29; ⇒ Mk 14:12-25; ⇒ 1 Cor 11:23-26. 165 Cf. ⇒ 2 Cor 11:26. 166 ⇒ Acts 2:42, ⇒ 46. 168 AG 1; cf. ⇒ 1 Cor 11:26. 1350 The presentation of the offerings (the Offertory). Then, sometimes in procession, the bread and wine are brought to the altar; they will be offered by the priest in the name of Christ in the Eucharistic sacrifice in which they will become his body and blood. It is the very action of Christ at the Last Supper - "taking the bread and a cup." "The Church alone offers this pure oblation to the Creator, when she offers what comes forth from his creation with thanksgiving. "175 The presentation of the offerings at the altar takes up the gesture of Melchizedek and commits the Creator's gifts into the hands of Christ who, in his sacrifice, brings to perfection all human attempts to offer sacrifices. 1353 In the epiclesis, the Church asks the Father to send his Holy Spirit (or the power of his blessing178) on the bread and wine, so that by his power they may become the body and blood of Jesus Christ and so that those who take part in the Eucharist may be one body and one spirit (some liturgical traditions put the epiclesis after the anamnesis). asterisk (*) is from chap. 67. 172 Cf. ⇒ Lk 24:13-35. 173 Cf. ⇒ 1 Thess 2:13. 174 ⇒ 1 Tim 2:1-2. 175 St. Irenaeus, Adv. haeres. 4, 18, 4: PG 7/1, 1027; cf. ⇒ Mal 1:11. 1363 In the sense of Sacred Scripture the memorial is not merely the recollection of past events but the proclamation of the mighty works wrought by God for men.182 In the liturgical celebration of these events, they become in a certain way present and real. This is how Israel understands its liberation from Egypt: every time Passover is celebrated, the Exodus events are made present to the memory of believers so that they may conform their lives to them. 181 ⇒ 1 Cor 11:24-25. 182 Cf. ⇒ Ex 13:3. 183 Cf. ⇒ Heb 7:25-27. 184 LG 3; cf. ⇒ 1 Cor 5:7. 187 Council of Trent (1562): DS 1740; cf. ⇒ 1 Cor 11:23; ⇒ Heb 7:24, ⇒ 27. 188 Council of Trent (1562): DS 1743; cf. ⇒ Heb 9:14, ⇒ 27.
brother; Conf. 9, 11, 27: PL 32, 775. 194 St. Augustine, De civ Dei, 10, 6: PL 41, 283; cf. ⇒ Rom 12:5. 195 ⇒ Rom 8:34; cf. LG 48. 197 Cf. ⇒ Mt 25:31-46. 203 St. Ambrose, De myst. 9, 50; 52: PL 16, 405-407. 204 Council of Trent (1551): DS 1642; cf. ⇒ Mt 26:26 ff. ; ⇒ Mk 14:22 ff. ; ⇒ Lk 22:19 ff. ; ⇒ 1 Cor 11:24 ff. 208 Cf. ⇒ Gal 2:20. Alexandria, In Luc. 22, 19: PG 72, 912; cf. Paul VI, MF 18. 1385 To respond to this invitation we must prepare ourselves for so great and so holy a moment. St. Paul urges us to examine our conscience: "Whoever, therefore, eats the bread or drinks the cup of the Lord in an unworthy manner will be guilty of profaning the body and blood of the Lord. Let a man examine himself, and so eat of the bread and drink of the cup. For any one who eats and drinks without discerning the body eats and drinks judgment upon himself. "216 Anyone conscious of a grave sin must receive the sacrament of Reconciliation before coming to communion. 1387 To prepare for worthy reception of this sacrament, the faithful should observe the fast required in their Church.218 Bodily demeanor (gestures, clothing) ought to convey the respect, solemnity, and joy of this moment when Christ becomes our guest. 1389 The Church obliges the faithful "to take part in the Divine Liturgy on Sundays and feast days" and, prepared by the sacrament of Reconciliation, to receive the Eucharist at least once a year, if possible during the Easter season.221 But the Church strongly encourages the faithful to receive the holy Eucharist on Sundays and feast days, or more often still, even daily. 1390 Since Christ is sacramentally present under each of the species, communion under the species of bread alone makes it possible to receive all the fruit of Eucharistic grace. For pastoral reasons this manner of receiving communion has been legitimately established as the most common form in the Latin rite. But "the sign of communion is more complete when given under both kinds, since in that form the sign of the Eucharistic meal appears more clearly. "222 This is the usual form of receiving communion in the Eastern rites. 1392 What material food produces in our bodily life, Holy Communion wonderfully achieves in our spiritual life. Communion with the flesh of the risen Christ, a flesh "given life and giving life through the Holy Spirit,"226 preserves, increases, and renews the life of grace received at Baptism. This growth in Christian life needs the nourishment of Eucharistic Communion, the bread for our pilgrimage until the moment of death, when it will be given to us as viaticum. 1398 The Eucharist and the unity of Christians. Before the greatness of this mystery St. Augustine exclaims, "O sacrament of devotion! O sign of unity! O bond of charity! "234 The more painful the experience of the divisions in the Church which break the common participation in the table of the Lord, the more urgent are our prayers to the Lord that the time of complete unity among all who believe in him may return. 213 St. Ambrose, De Sacr. 4, 2, 7: PL 16, 437D. benedictione caelesti et gratia repleamur. 216 ⇒ 1 Cor 11:27-29. 217 Roman Missal, response to the invitation to communion; cf. ⇒ Mt 8:8[ETML:C/]. 218 Cf. ⇒ CIC, can. 919. 219 Cf. ⇒ CIC, can. 917; AAS 76 (1984) 746-747. 221 OE 15; ⇒ CIC, can. 920. 227 St. Ambrose, De Sacr. 4, 6, 28: PL 16, 446; cf. ⇒ 1 Cor 11:26. 230 Cf. ⇒ 1 Cor 12:13. 231 ⇒ 1 Cor 10:16-17. 232 St. Augustine, Sermo 272: PL 38, 1247. 233 St. John Chrysostom, Hom. in 1 Cor. 27, 4: PG 61, 229-230; cf. ⇒ Mt 25:40. 235 UR 15 # 2; cf. ⇒ CIC, can. 844 # 3. 238 Cf. ⇒ CIC, can. 844 # 4. 1406 Jesus said: "I am the living bread that came down from heaven; if any one eats of this bread, he will live for ever; . . . he who eats my flesh and drinks my blood has eternal life and . . . abides in me, and I in him" (⇒ Jn 6:51, ⇒ 54, ⇒ 56).